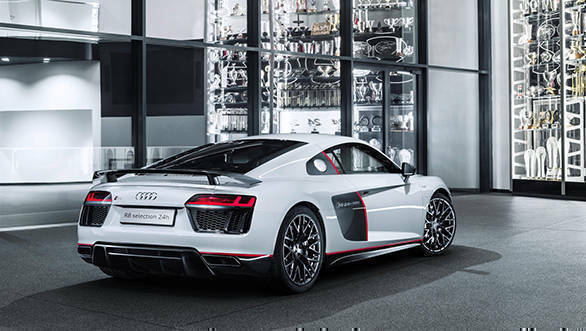 Audi has launched a special edition of the R8 V10 plus, called the "selection 24h". The "selection 24h" is going to be a limited production of only 24 units, since the Audi R8 LMS won the 24-Hour Nurburgring on its debut. The special edition gets a few upgrades over the standard R8 V10 plus, including dynamic steering, adaptive damper control system, Audi's magnetic ride system, as well as laser-equipped headlights. On the trim side of things, the special edition is finished in Suzuka gray with Mythos black and Misano red highlights. The front splitter, rear diffuser, side mirror housings, rear wing as well as the engine cover are all finished in glossy carbon fibre (there can never be too much carbon fibre). The sport exhaust tips are finished in black, and the car sits on 20-inch 10-spoke aluminium alloys. The special edition gets the same engine from the regular R8 V10 plus, a 5.2-litre V10 producing 610PS and 560Nm of torque. The engine is mated to a 7-speed S-tronic dual-clutch transmission, with power sent to all four wheels via Audi's Quattro system. With a dry weight of 1454kg, this results in a 0-100kmph time of 3.2 seconds and a top whack of 330kmph. 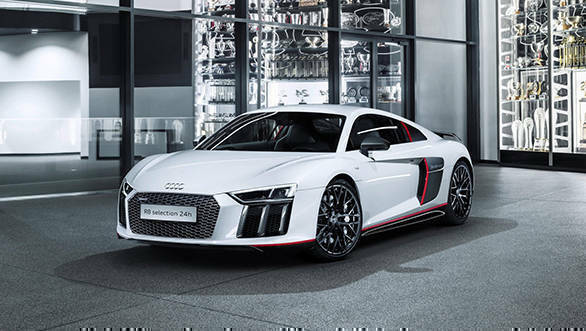 The Audi R8 V10 plus "selection 24h" is currently up for ordering, with a 2,29,000 (Rs 1.74 crore) sticker price in Germany. Don't bring your hopes up, as the chances of this version hitting Indian shores are pretty slim.